Primary 7 pupils will attend 'Bee Safe' safety-awareness sessions tomorrow (Monday 25th February). They will leave school at 09:00, travel by coach and will be back by lunchtime. They should wear school uniform as normal. Bee Safe is an imaginative way of teaching Primary 7 pupils how to prevent everyday accidents and dangerous situations and how to deal with them safely and effectively should they occur. They use a practical approach with interactive quizzes and role plays, designed to promote a high level of interaction and involvement from pupils. The children will learn about a range of issues, including the dangers presented by electricity, fire and the roads, as well as the role of the emergency services and how they should react in an emergency. The events will also help the children be aware of their personal safety and how to avoid potential dangers, whether at home or out and about. 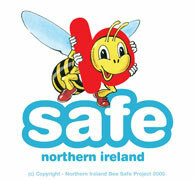 The 'Bee Safe' initiative is an annual event and is the result of a partnership between North Down and Ards Home Accident Prevention Committee, PSNI, Ards Borough Council, NI Fire & Rescue Service, Department of the Environment, Translink, NIE and the RNLI. It is a Northern Ireland-wide initiative and is funded locally by the North Down and Ards Home Accident Prevention Committee, Investing for Health, DPP and Ards Community Safety Partnership. Posted on February 24, 2013 by Holywood Primary.